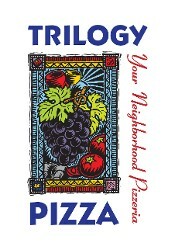 Come visit Trilogy Pizza and experience the mouthwatering taste of our amazing pizza! Our selections of cheese, meat, and other toppings can't be beat. We are located in beautiful San Antonio, Texas. Originally introduced to New York from Naples, Italy, in the early 1900s, New York-style pizza has become distinctively American. The hand tossed crust is very thin, slightly crispy on the outside, and chewy on the inside. The sauce is a simple marinara, and the cheese is 100% whole milk mozzarella. Since the 1940s, the identifying feature of Chicago-style pizza is a deep dish with massive amounts of ingredients. Olive oil is used in the pans to add a slightly fried crispness to the crust. Mozzarella cheese is placed directly on top of the dough. The toppings are placed on the cheese and then a flavorful marinara sauce is poured on top to create a two-inch deep pie! Our own signature blend of spice and cheese is added for the final touch. In the 1970s, creative culinary experts in California started experimenting with non-traditional toppings and sauces. The Trilogy California Style Pizza is based on a thin wheat crust made from scratch with organic agave nectar and basil, resulting in outstanding flavor and texture. Let your imagination take it from there! Capone — Marinara, mozzarella, Italian sausage, pepperoni, black olives, mushrooms, and green bell peppers. Texan — Marinara, pepperoni, Italian sausage, and Canadian bacon. Quattro Carni — For the meat lover! Pepperoni, beef, bacon, and meatballs. Farmers Market — Garlic-infused olive oil, mozzarella, feta, chicken, spinach, tomatoes, zucchini, and artichokes. Spinach Pie — Marinara, mozzarella, fresh spinach, bacon, mushrooms, and red onions. Pesto Chicken — Marinara, mozzarella, pesto, chicken, garlic, tomatoes, and red onions. Brooklyn — Marinara, mozzarella, Italian sausage, onions, and green bell peppers. Made in the tradition of the Italian peasants who invented pizza, the result is a simple, fire-charred, thin and crispy pizza. Always made with our New York Style dough, it comes in any size for the same price as our specialty pizzas. Old World Classic Pepperoni — Marinara, olive oil, garlic, fresh mozzarella, and pepperoni. Old World Classic Margherita — Marinara, olive oil, garlic, fresh mozzarella, sliced tomatoes, and basil. Old World Classic White — Olive oil, garlic, fresh mozzarella, parmesan, and ricotta.